Mort Künstler Hand Signed and Numbered Limited Edition 2011 Official Snow Print:"...How Real Soldiers Live"
Image Dimensions: Limited Edition Print Image size: 27" x 21.5" / Overall size: 32" x 25.5" Canvas Sizes 21" x 17", 26" x 21" and 35" x 28". Mort Künstler's Comments : This painting can be considered a prequel to my painting "Merry Christmas, General Lee," in which General Robert E. Lee is riding away from the famous Corbin family estate of Moss Neck. 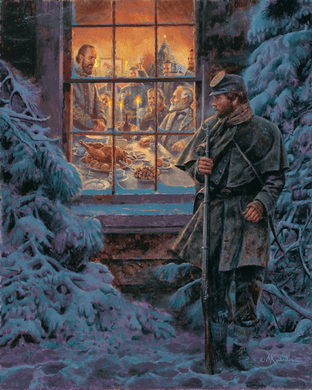 On Christmas night, as guests arrived for a party at the mansion, Lee was leaving the small office building of the grand estate where he had attended a Christmas dinner at the invitation of Stonewall Jackson. I always wanted to do a painting of that dinner, but could not bear to do a totally indoor scene for my annual winter snow print. After years of trying to come up with a composition that would say "snow" and Christmas dinner, I finally composed this painting. It was inspired by the single paragraph in Douglas Southall Freeman's monumental biography of Robert E. Lee that stated: "For his own dinner he went by invitation to Jackson's headquarters, where the doughty ‘Stonewall' entertained him, Pendleton, and their staffs. Jackson had received many presents of food from admirers and was able to spread a sumptuous table, not forgetting to have his waiters in white aprons. This fastidious touch, in such a setting, appealed to Lee's sense of humor. He had much jest at the lavishness of Jackson's entourage. Jackson and his lieutenants, he said, were playing at soldier. They must come and dine with him to see how real soldiers lived. His great lieutenant, of course, was both pleased and confused at Lee's comments. "My idea was to capture the viewer in an emotional moment. I decided to contrast the cold loneliness of the sentry peering in the window, to the warm convivial atmosphere of the party going on inside. I also used a cool color palette for the outside of the building and, quite naturally, the warm colors at the opposite end of the spectrum for the interior scene. Making the sentry large emphasized the story of the different circumstances of the officers and the sentry. I tried to depict the private as perhaps envious, but in awe of getting this close private view of the two great Confederate generals. It also gave me an opportunity to show them as smiling and very human. In my quest for a new a nd different look, I also decided on a vertical composition. Dr. James I. Robertson, the famed biographer of Jackson says in his great biography, "The appearance of wine on Jackson's table evoked a playful burst of feigned disgrace…even Lee laughed boisterously. Jackson's slight smile hardly masked his discomfort." Both Jackson and Lee were teetotalers, and rarely did either one ever enjoy the comforts of anything more than a tent for their headquarters. Placing them both in this comfortable setting reinforces the notion that the holiday season truly was an opportunity to escape the pains of war, if even for a single night.